After having been knocked flat for three days by a stomach bug I brought with me home from Europe, I was finally recovering enough to catch up on local news. Expecting the usual, vigorous debate about the state budget and federal lands, I merrily opened the Casper Star Tribune's website. Really? This is how low the tax debate has plunged? Does the Tribune really want to have this debate in the sewage pipes of the political discourse? There are viable solutions to increasing school safety that don’t involve controversial issues like gun control or arming teachers. The problem is, like most things in life, they aren’t free. But we’ve all got a dog in this fight – a child that we love in public school – so it’s time to put our money where our mouth is. We’re glad to see Casper City Councilman Dallas Laird trying to do just that. He recently proposed implementing an additional 1-cent tax to fund school safety initiatives. Sales taxes in Wyoming are 4 cents, and Natrona County has a voter-approved fifth-cent tax. Laird’s proposal would raise the county’s sales tax to 6 cents, with the additional funds earmarked specifically for school safety. So, dear fellow parents, the way you show your love for your children is by asking, pleading, begging for higher taxes. You don't show your love for your children in your 24/7 endless presence, care, interaction, guidance and worry. No, it's the tax bill, folks. That's what matters. Of course, Laird’s suggestion would face obstacles – the biggest being Wyomingites’ vehement opposition to raising taxes. Voters may object – it’s almost inevitable that they will. But is one cent on every dollar too high a cost for a child’s life? We can’t keep tiptoeing around what is at stake. It’s easy when new taxes are proposed to look at the salaries of government officials, or to suggest going without other services to find the money in the budget. But city leaders aren't being overpaid. And the fat is already trimmed. Take a moment and read that last sentence again. Would Casper residents rather go without show plows half of the time in order to fund school safety? Maybe some of the money that's earmarked for street repairs can be reallocated to avoid raising taxes. Or maybe we can't always have our cake and eat it too. So the fat has already been trimmed? Does the Tribune have any evidence to back that up? 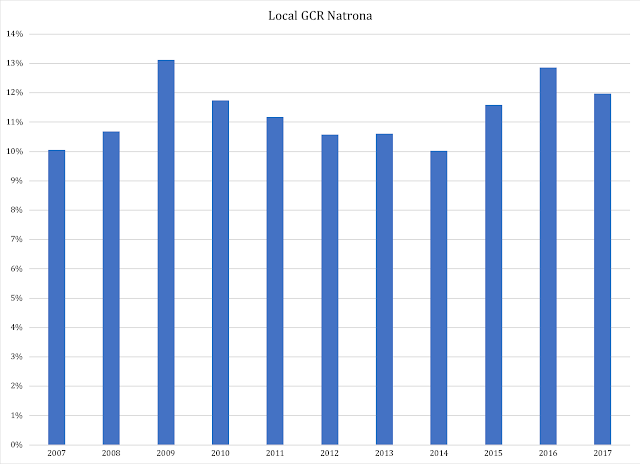 Here is the problem, namely: Bureau of Labor Statistics data suggests that the burden of local government on Natrona County taxpayers has increased quite a bit recently. For example, the total amount of wages paid out to local government employees in Natrona County increased by 5.1 percent from 2012 to 2017 (measured as third-quarter figures at annualized rates). In the same time period, compensation of private-sector employees fell by 7.1 percent. Plain and simple: local government in Natrona County has not at all "trimmed the fat". The private sector has had to make big cuts - $417 million in lost wages and salaries just from 2014 to 2016 - but when that happened we never heard the Tribune trumpet out that the fat had already been trimmed and no more cuts could be made. Short term, government needs to stay on par with what the private sector can afford. By not matching its size accordingly, Natrona County's local governments have effectively created a tax hike on their private-employee residents. Long term, to make sure government does not become unbearably costly in future economic downturns, we need a stern and frank conversation about what the core functions of government really are. In plain English, we have to stop thinking about government as elevated above the realities of a free-market economy. The less government promises to do; the more government leaves to us to take care of together, in free, private and gainful exchange; the better we can protect the limited government we will have from the ups and downs of our business cycle. With reference to the Tribune's editorial about school safety officers, the lesson is simple: reprioritize, and don't do it with scare tactics. Open the books in local governments, open the books all the way into the last tax dollar spent in Natrona County, including but not limited to the schools. Let the people who bring home the bacon see for themselves whether or not the fat has been trimmed. Then we can have a real conversation about how to spend taxpayer's money.